A "Cut List" shows woodworkers how to cut a set of parts from a set of available stock. This program creates a diagram showing the stock pieces and how the required parts may be cut from them. The original program was posted in 2003 and has been the most downloaded program on DFF for many years. It is a bit complex so I have avoided making changes, but recently added support for Unicode characters in project files names at a user's request. He says it is working for him, so here is CutList Version 4.0 with the Unicode feature and a new feature which will display multiple solutions, not just the one that the program thinks is the "best". Program changes required the use of a much newer version of Delphi than my old favorite, which may have introduced undetected errors. As always, please use the feedback link to report problems. September 28, 2014: We're back from a two week visit to four of the six countries which make up the former country of Yugoslavia: Croatia, Slovenia, Montenegro and Bosnia-Herzegovina. Beautiful country with reasonable prices, an interesting but complicated history, and more tourist crowds (and rain) than one would expect in September. We're glad we went, but also glad to be home. 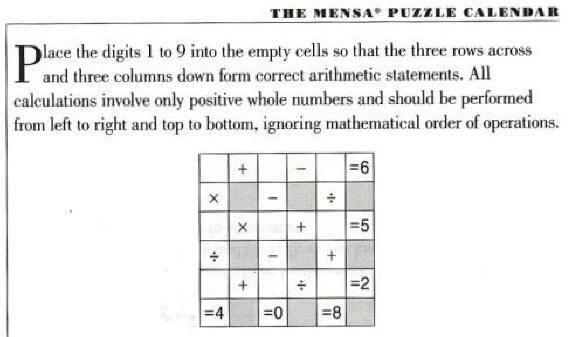 I created Brute Force Version 3.2 today to let it successfully solve this Sept. 26 puzzle from our Mensa Day-by-day calendar. is also OK on the other side? Marilyn says that the other side is also good 2/3 of the time, but I wrote this simple Beginner's level program to simulate a million trials to prove it to myself. You can find the downloads of source and executable at the bottom of our Beginner's Page.